Perhaps you've already decided to redo the mulch in your landscaping, but you aren't quite sure who sells rubber mulch or all the advantages of using it. Once used almost exclusively on community and school playgrounds, rubber mulch made from recycled tires has become much more common. Today, even home gardeners use this durable mulch in their landscaping. In fact, President Obama uses rubber mulch on the White House playground for his two young daughters. At first glance, the price of rubber mulch is a little prohibitive, although as the specialty product becomes more common the price does seem to be going down a bit. However, when you factor in the cost of replacement, rubber mulch is actually quite economical. Traditional wood mulch has to be replaced every year or two, but rubber mulch lasts many more years. It is heavier than wood mulch, so storms will be less likely to deplete your mulch inventory. However, there are some critics of rubber mulch. Not only can it cost almost double what wood chips cost, but some fear it may leach chemicals into the soil that can harm shallow rooted plants and flowers. Studies have been inconclusive as to whether or not this is a serious concern. However, there is no doubt that the rubber is highly flammable. This means that encircling the landscape borders around your home may not be the best idea. Many experts recommend using the rubber mulch for walkways, playgrounds and non-plant areas that are separated from your residence. On the other hand, some of the rubber mulch companies conducted studies that stated there is no danger at all in using the mulch. Keep in mind that the companies that sell this product conducted these studies and use your best judgment regarding where to put the mulch. Once you make the decision to purchase rubber mulch and decide how much you need, you'll want to know who sells rubber mulch near you or where you can order it. There are many stores that advertise their services online and will come out and create a custom, rubber mulch look for you, or from which you can purchase rubber mulch in bulk. RubberMulch.com has a pricing guarantee, so you can make sure you aren't overpaying for your rubber mulch. This mulch comes in a variety of really bold and bright colors, including blue and green. Their website explains why rubber mulch is good for the environment and good for the consumer. 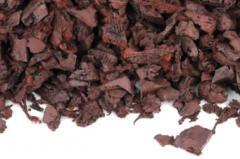 International Mulch offers 100 percent recycled rubber mulch. The mulch actually looks quite natural and is dyed in shades of brown and red. They also offer a unique product called Rubberific Timber. It is basically a rubber curb that you can form around trees, borders and anywhere else you need to section off your yard for a uniform, well-maintained look. If you are using rubber mulch for a playground area, be sure to check the metal quantities in the mulch and to purchase mulch made especially for playground use. Rubber mulch is durable, can be dyed unique colors and is low maintenance.